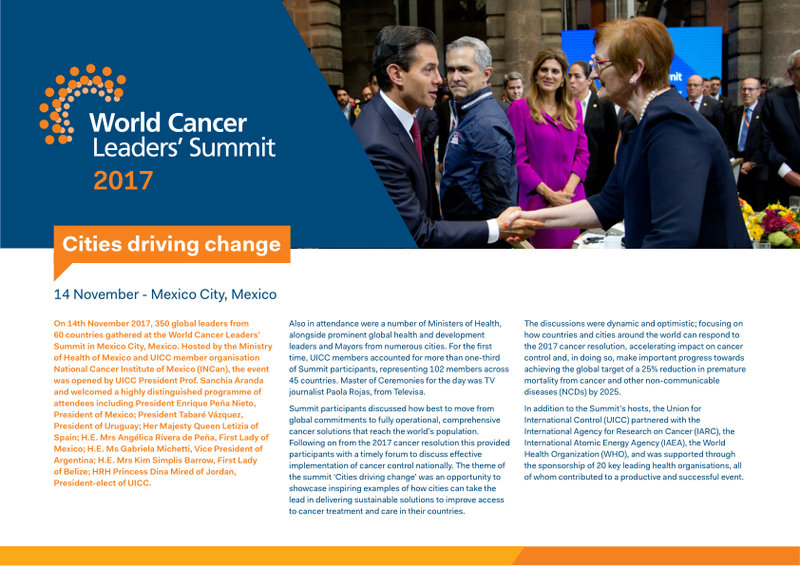 On 14th November 2017, 350 global leaders from 60 countries gathered at the World Cancer Leaders’ Summit in Mexico City, Mexico. Hosted by the Ministry of Health of Mexico and UICC member organisation National Cancer Institute of Mexico (INCan), the event was opened by UICC President Prof. Sanchia Aranda and welcomed a highly distinguished programme of attendees including President Enrique Peña Nieto, President of Mexico; President Tabaré Vázquez, President of Uruguay; Her Majesty Queen Letizia of Spain; H.E. Mrs Angélica Rivera de Peña, First Lady of Mexico; H.E. Ms Gabriela Michetti, Vice President of Argentina; H.E. Mrs Kim Simplis Barrow, First Lady of Belize; HRH Princess Dina Mired of Jordan, President-elect of UICC.